This little creature was so cooperative that I felt I had to include him in my travelog. 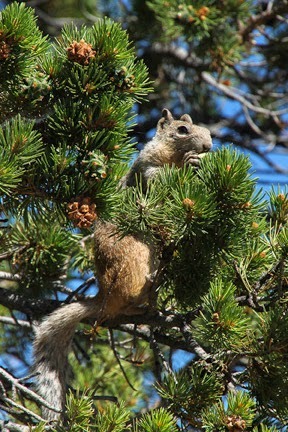 S/he was quite busy gathering nuts from the pine cones and by stuffing his cheeks s/he could carry quite a lot back home in one trip. But s/he was also nibbling to get his breakfast. The cute little thing didn't seem much bothered by our presence nor cameras.